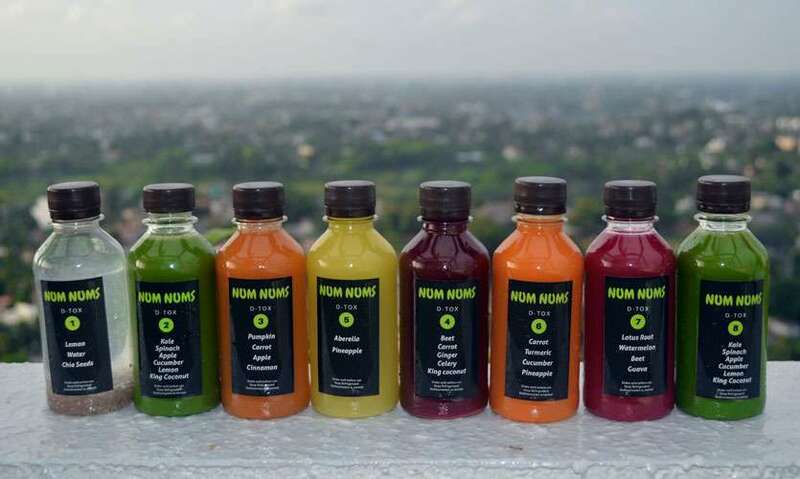 Num Nums Juices are cold pressed with no added sugar, no water or preservatives. It is pure vegetable and fruit extraction. Each bottle contains almost 1/2 kg of vegetables and fruits in them. 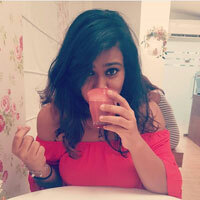 Therefore, making it a nutritious power packed healthy natural detox and yes they deliver in and around Colombo. Delivery rates vary depending on the location. We had a chat with the owner of Num Nums Nishanee Fernando who started Num Nums 4 months ago to help us understands this better. Num Nums is an interesting name, how did you come up with it? Thank you. The name came quite easily and naturally to me when I was contemplating how to market the healthy range of detox juices. The words Num Nums is linked to my childhood memories. 'Num-Num' is a childish sound that is made to signify tasty food. When I was younger yummy food use to be called Num Nums. I am a big foodie so eating healthy doesn't mean we cannot enjoy yummy food. When people think of veggie juices they don’t necessarily think they are going to be tasty too. So, I hope to change that perception people have about healthy food. 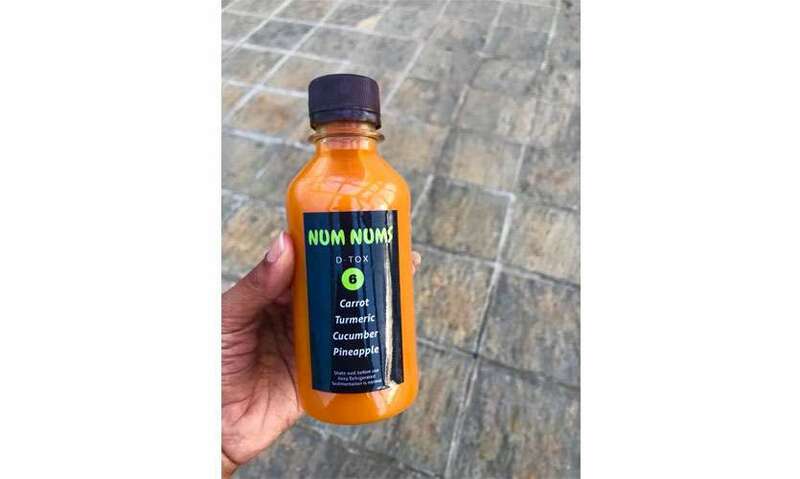 I assure you that Num Nums juices are carefully designed to detox your whole body as well as give you the yummiest taste experience you have ever had. I also wanted to always ensure that there is a lot of fun and joy behind anything I commit to doing. What better way, than include the same in the name of the products I promote and sell. Tell us a little bit about your background and why you decided to start the brand? My Culinary journey and love for food started at a very young age. I was born into a family where we loved cooking with so much passion that at our family gatherings, much of our time was spent around the kitchen preparing exotic dishes. I was 17 when I completed my diploma in culinary art and there onwards did my bachelor’s degree in marketing & Management. However, my passion has always been food and no matter where I am I always come back to inventing & creating food. I have been a director of Zensai foods for the past 17 years and we are into manufacturing of condiments. I lectured at the City & Guilds program on culinary Art for two years teaching students the value of nutrition, techniques and skills of cooking, safety and health. I was diagnosed with very high cholesterol levels at the age of 30 (even though I was working out four times a week). My journey into health food started thereafter and I was always determined to eat yummy healthy food. I used to spend hours inventing meals that are not only healthy but taste good too. It has been four months since we started this new venture and it has been an exciting and eventful journey. My partner in life has been very supportive of everything that I do and encourages me all the way. If not for him I wouldn’t have been able to start up this business and do wonderful things to help and encourage people to live a healthy life and choose healthy options. Before we start anything, can you please explain to us what juice cleanse? A juice cleanse is a way to give your body a rest from having to process fats, additives, and countless other toxins that work their way into our diet. We live in an era where fast food has become a normal everyday activity and adults as well as children are taking in countless amounts of processed food with toxins and chemicals that we are sadly unaware of. The reality is no matter how careful we are at some point we are likely to consume some form of chemicals or toxin. Over the years these toxins build up in our bodies. A juice cleanse is like an overdue cleaning for your body. A raw juice cleanse is the most natural way to detoxify the body. Free of the burden of digestion, the body will begin the process of shedding toxins that have built up over the years. Our combination of carefully designed raw juices will help flush out toxins and rebuild the immune system. Drinking our juices will flood the body with necessary vitamins, minerals and living enzymes. While using very little energy to soak up these essential nutrients, it allows your body to rebuild, renew and heal naturally. Our juices not only detox your body but also provide an exceptionally pure source of nutrition. They are created with high-quality fruits and vegetables, and nothing else! Our customers can choose the duration of their cleanse, and we will deliver it fresh to your doorstep! What are the health benefits of a juice cleanse, why should you do one and how often should you do it for a month? Detoxing one’s body is fast becoming a new trend in the world of fitness. While the word is masked with multiple ambiguities, those who have incorporated detoxification as an important component in their fitness routine can’t stop talking about its natural health benefits. So, what does detoxification really mean and why is it important? As the name suggests, detoxing aims to help the body rid itself of toxins. The human body has many natural pathways to allow detoxification through the liver, sweat, urine, faeces and more. But our fast lifestyles, exposure to pollutants, heavy metals, preservatives and pesticides has taken the average toxin consumption by human beings to an all-time high. These toxins get stored in tissues and cells of our bodies and manifest in harmful ways. By detoxing your body, you help the vital organs cleanse themselves of the toxins, and enable the liver to function appropriately in excreting them. One of the best aspects of detox drinks is that it helps you lose weight naturally. Detox drinks offer a major boost to your metabolism, thus aiding weight loss. Detox drinks provide your digestive system with healthy nutrients and serve as a great laxative agent to ease your digestive functioning. Detox drinks also facilitate better liver functioning which plays a huge role in digestion as well. At a time where many of our lifestyle habits may be working against our liver (alcohol, nicotine, caffeinated and carbonated beverages and fatty foods), it becomes more than essential to give your liver a regular dose of detox to ensure its proper functioning. Detox drinks filter out toxins from the food we consume and also help provide digestive juices to disintegrate them from the healthy nutrients. By reducing inflammation and cleansing your body of the toxin overload, detox drinks minimize signs of ageing. Environmental pollutants and chemical deposits on your skin leads to wrinkles and dryness, detox drinks with vitamin C rich fruits purify your skin cells and gives you rejuvenated and glowing skin. Detox drinks work against the toxic overload weighing down on your mind. It cleanses you from within, and you feel a remarkable boost in your energy levels. Ingredients like mint &lemon not only rejuvenate your body but also increase your mental alertness. These drinks also help you restore your hydration which will keep you going through a long exhausting day. It’s hard to change a long-standing habit, and a detox program – no matter how long – is one way to put a wedge between your old ways and your new ones. If you have addictions to sugar, caffeine, fried, or crunchy foods you can use a detox program to help you kill those cravings. Often if you just try to quit eating those foods or drinking those beverages you’ll have limited success and go back to your old ways. But if you cleanse the body and replace those foods with healthier choices, you can retrain yourself and be more likely to stick to your new habits. A good detox program will pay some attention to your state of mind during the cleanse. The use of meditation is often recommended as a way to get back in touch with your body during this time of purging and cleansing of toxins. Detox followers often say that they lose that sense of fogginess andare able to think more clearly during a detox than when not on it. It makes sense since many of the sugar-filled and fat-filled foods that surround us each day will cause us to feel lethargic and can factor heavily in the quality of our thinking. By the time you can see your hair, it’s already considered dead, as all its growth occurs within the hair follicle. Therefore, it’s important to keep your body functioning at its full potential through a regular detoxing strategy. When your hair can grow uninhibited by internal toxins you’ll see and feel the difference in your hair. In many instances, hair gets shinier and feels softer to the touch. Detoxing isn’t enough to stop male pattern baldness, but many report that their hair grows more quickly, a sign of healthier hair. One of the benefits of detoxing is a feeling of being lighter. When you stop eating foods that weigh you down and replace them with fresh fruits and vegetables, a lighter feeling is bound to occur. The constant barrage of toxins that the body has to deal with is one contributing factor to the aging process. By reducing the amount of free radical damage done to the body, you’re going to see not only short-term benefits, but also long-term benefits in an increased longevity. When you finish your detox program, it’s very important not to go right back to the lifestyle that was causing the toxicity. Sticking to an improved diet and getting daily activity are great ways to make sure that you feel good each moment of your life. Is there an age restriction for this? No there is no such age restriction for a juice cleanse, however, we do recommend it for individuals under 16 years of age. How should you prepare your body before the cleanse? Before embarking on a juice cleanse there are few steps that we need to take toget the maximum benefit of the juice cleanse. Before beginning one of our juice cleanses it is very important to prepare your body for the deeper levels of cleansing by gradually reducing the overall level of toxicity and moving your body into a nice alkaline state. It is very important that you pre-plan dates for the cleanse, so that you can clear your calendar accordingly. Choose the days where extra work and social engagements will not distract you and possibly tempt you during your cleanse. Just think of these days as a gift to yourself to nourish and heal. Other than the 8 bottles can you consumes anything else? What are the packages you offer and how much does each cost(e.g. : -1-day cleanse, 2-daycleanse, etc.)? 1 day, 2 day and 3 day cleanse program. Prices are as follows. 1 day Rs.3000, 2day Rs.6000, 3day Rs.9000. A day’s cleanse will comprise of 8 Detox Juice bottles which need to be taken every two hours. All the bottles are numbered from 1-8 and you need to take it according to the number stated on the bottle. We deliver all the goods right to yourdoorstep. Can you buy an individual bottle if you just want to drink a healthy juice? You cannot buy the juices individually, but we do sell them to pregnant mothers and children who are fuzzy eaters of vegetables in sets of eight. How do you know when your Body needs a detox? Our bodies have a natural self-cleansing mechanism, however, due to our fast lifestyles this natural self-cleansing mechanism is overworked, we may see symptoms such as bloating, fatigue, dark rings around the eyes, insomnia, poor digestion, constipation, stress and dull skin. Is there anyone who shouldn’t be on a juice cleanse? Pregnant mothers and children under the age of 16 should not be on a juice cleanse. However, they can supplement their meals with a tasty juice but not use it as a meal replacement or cleanse. The Num Nums detox is specially designed to detox every part of your body. Each ingredient chosen has its own unique benefit, below are the list of ingredients in each bottle and the benefits of each them. The Num Nums is specially designed to detox every part of your body. A day’s cleanse will include all of the above ingredients to give you the best detox experience you can ever hope for. Lemons are high in antioxidants and contains a high concentration of vitamins, minerals, and antioxidants. These include vitamin C, calcium, potassium, magnesium, citric acid, pectin, limonene, and bioflavonoids. All these compounds work together to supercharge the immune system, and to keep our bodies functioning optimally. Drinking lemon water, especially with fibre-rich chia seeds, can help to ease a range of digestive disturbances, such as bloating and indigestion. Lemon water is mildly diuretic in nature, and can thus help to cleanse the urinary tract of bacteria. It also stimulates the liver to produce bile. Since your liver is your body’s main detoxification organ, keeping it in tip-top shape is essential. These are a nutritional powerhouse! They are high in fibre, omega-3 fatty acids, protein, calcium, iron, and magnesium. They also contain vitamins B1 and B3, which are essential to a properly functioning nervous system. Additionally, chia seeds contain an abundance of antioxidants. The sweet nectar is loaded in antioxidants that help prevent cellular damage and loss within the brain. Honey is also well known for its antibacterial and antifungal properties. It is a natural antibiotic that work both internally and externally. Kale has one of the highest levels of antioxidants of any plant you can eat and can help reduce inflammation, lower cholesterol and detox the liver.It also reduces heart disease by lowering cholesterol and aids in weight loss. Cucumbers are full of antioxidants &anti-inflammatory agents. Cucumbers help the liver and gut detoxify and remove toxins. They are also good for your kidneys. Spinach is high in iron and vitamin C which are crucial for the building and maintenance of collagen, which provides structure to skin and hair. Iron deficiency is a common cause of hair loss, which may be prevented by an adequate intake of iron-rich foods. Apples help prevent inflammation, fights heart disease and improves digestive health. Cinnamon is one of the most delicious and healthiest spices on the planet. It can lower blood sugar levels, reduce heart disease risk factors and has a plethora of other impressive health benefits. pumpkin contains a tremendous amount of potassium, beta-carotene, alpha-carotene, beta-cryptoxanthin, and Vitamin A. Its Vitamin A properties protects cells against the effects of free radicals in the body and the environment, and also plays a role in maintaining a healthy immune system (which helps the body defend itself against disease), the reproductive system, bones, vision, and cell functions. Pumpkin also contains calcium, iron, magnesium, phosphorus, copper and vitamins C, E, and K. As you can see pumpkins are loaded with vitamins, nutrients, and substances that help keep the body healthy and working efficiently especially the digestive system. This special tea had unbelievable amounts of health benefits. Oolong Tea boosts your metabolism, causing weight loss, lowers cholesterol, increases mental alertness, aids digestion, promotes healthy hair, improves your skin condition, stabilizes blood sugar, prevents tooth decay, prevents osteoporosis and forms strong bones& strengthens the immune system. beneficial in detoxifying your body due to the presence of bromelain. A powerful digestive enzyme. This enzyme has been proven to aid in digestion of protein, breaking down fats and reducing inflammation. Is rich in vitamin C. It helps boots immunity and helps free radical damage & accelerates the healing process. It also improves skin and digestion. When the liver is supported through the use of turmeric, it can also help to detox the blood, reduce inflammation, and prevent internal blood clotting. When the liver is properly cleansed, it also secrets bile which can help break down fats.It can also help relieve gas and soothe any inflammation in the digestive tract. Turmeric's anti-inflammatory properties are beneficial to those who have digestive problems. Turmeric is an effective antioxidant. By using turmeric, it can help the liver efficiently process metabolic wastes and toxins. Beetroot juice serves as a natural blood cleaner. It's able to help the body detox and cleanse the blood of heavy metals, toxins and waste due to its compounds called glutathione, which are essential for detoxification within the liver and other digestive organs. Nourishes blood, improves circulation, strengthens heart, stomach, spleen helps anaemia & improves the liver. Guava is the most antioxidant fruit for your immune system. Guava lowers blood pressure and blood lipids, reduces heart disease and halts free radicals. How about day to day activity while you are on a juice cleanse, can you exercise? or should you be a bit more relaxed? You can go about doing your normal activities without any issues. There is no such restriction on any activity that you may like to engage in. Make sure you drink plenty of water in-between and it will be just another day, however we do recommend that you do it on weekdays or days that you are free of social engagements and events because once you are on the cleanse you cannot eat your normal meals. So, its best the avoid days with parties or social gatherings. What does the future look like for Num Nums? The future looks bright for Num Nums. There is a lot I want to achieve through the products we currently offer, and those being developed and in the pipeline. 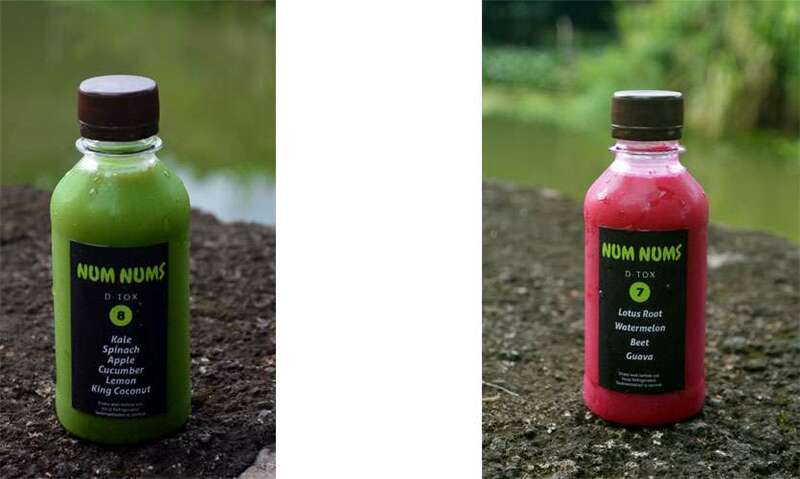 My goal for the moment is to continue offering healthy, great tasting detox juices and inculcate a habit where an individual decides to undergo a detox once a month and to do so helping one another, in pairs or in groups. In the end, we must work together to create a society that is healthier and more productive. Overall this was no stroll in the park , I decided to try the cleanse during the weekend as I felt I wouldn’t survive a 10 hour work day for 2 days without any solid food, Even though I did have something to drink every 2 hours (and I made sure I made it last as much as possible by taking small sips) I kept looking at the time and think of every descriptive passage of food ever written. I set up an alarm that would remind me to juice up because what would I be without some structure in my life. On the first day of the cleanse I was fine till about 2pm, this is when my energy sort of took a nose dive and I just fell asleep in a tuk tuk on the way to a friend’s place, I was pretty sleepy during this time till I had my 4th drink which revived me like a wilted flower during the rain, after that despite the few hunger pangs I resisted all the festivities around me ( congratulate me please, I have some semblance of self-control ) and had a pretty chilled out day despite my fluctuating energy levels and sleepiness. I actually woke up feeling really fresh and had a lot more energy than usual, but I was a lot hungrier than the first day which went away as the day progressed, since, on day two you can munch on a light salad or some apples and cucumber so I did just that and was content. Each one of us would react to the cleanse in different ways some actually get headaches or some have more energy, so do we think you should try it? Yes! Start with the 1 day cleanse and see, if at all you can practice your power of resisting which is very character building. The juices are absolutely delicious and I am glad I got through it without sitting in a corner crying it really wasn’t all that hard you just need to power through those dips in your levels and peaks of your hunger and you will be fine, also I lost 2kgs! So much win! Do not mix the order of drinking the bottles. It is designed to give you the maximum benefit and therefore one should follow the numbering. 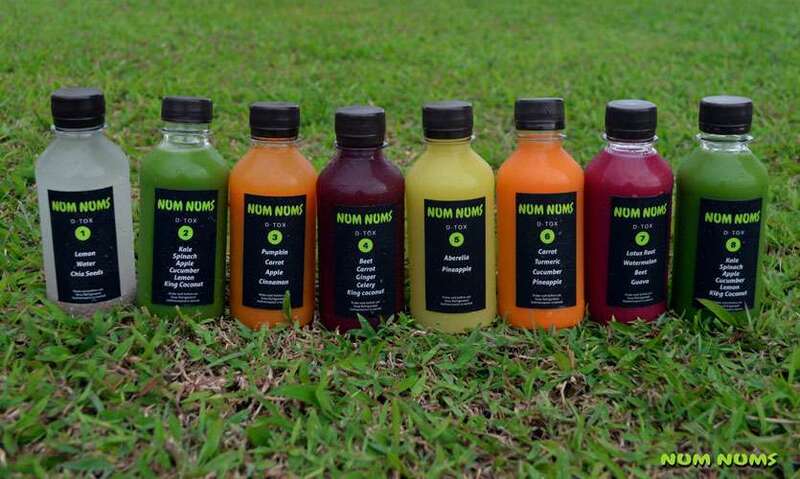 Num Nums juices have no preservatives in them and they are all natural. Therefore, the juices need to be kept refrigerated at all times. If you are going out, take only the bottle you need to consume. If you are traveling and staying out for more than 6 hours, it is advisable to take them in a cool bag. Weight yourself before and after the juice cleanse you as you will also lose some weight.